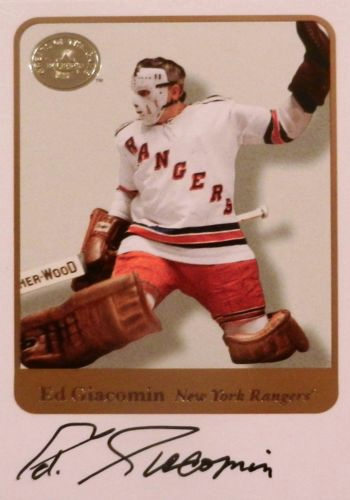 On March 15, 1989 The New York Rangers retired Eddie Giacomin’s number, the second player to receive that honor. 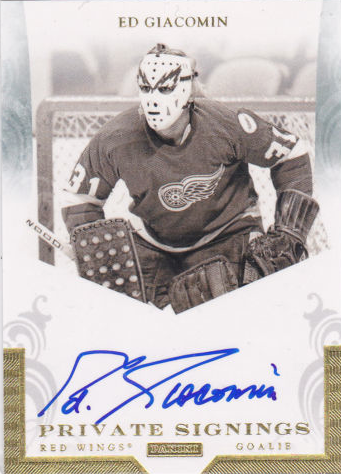 Giacomin spent the first 10 seasons of his 13 year career with the Rangers and was their top all-time goalie when he left for the Detroit Red Wings, the only other team he played with before retiring. Giacomin played in six NHL All-Star Games. In 1971 he shared the Vezina Trophy as the NHL’s top goaltender with Gilles Villemure.. Giacomin was inducted into the Hockey Hall of Fame in 1987. 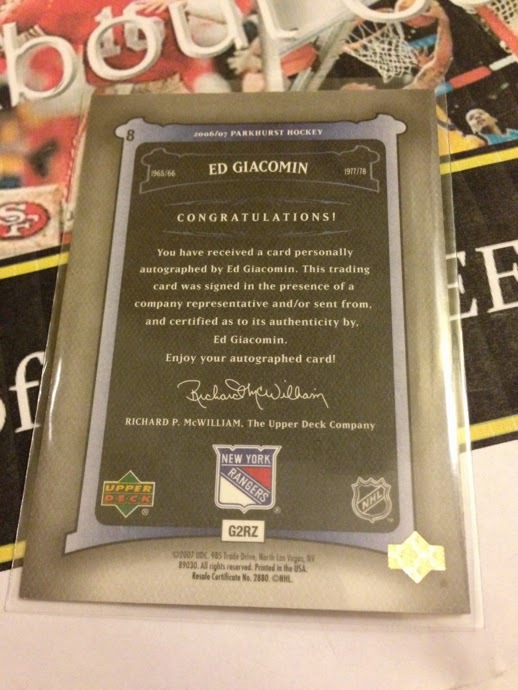 When it comes to Giacomin’s certified on-card autos the vast majority of them are from ITG with over 40 availble. 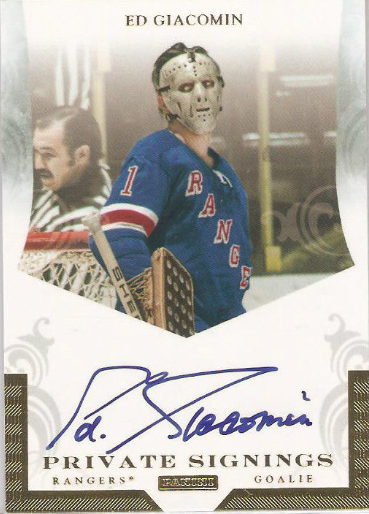 While I appreciate what In the Game has done with their hockey cards, I tend to look for a card from one of the major manufacturers, unless the number of available options is extremely limited. Without ITG and some other small oddities, there were eight unique cards left. That’s pretty tight, but I still eliminated three more cards. 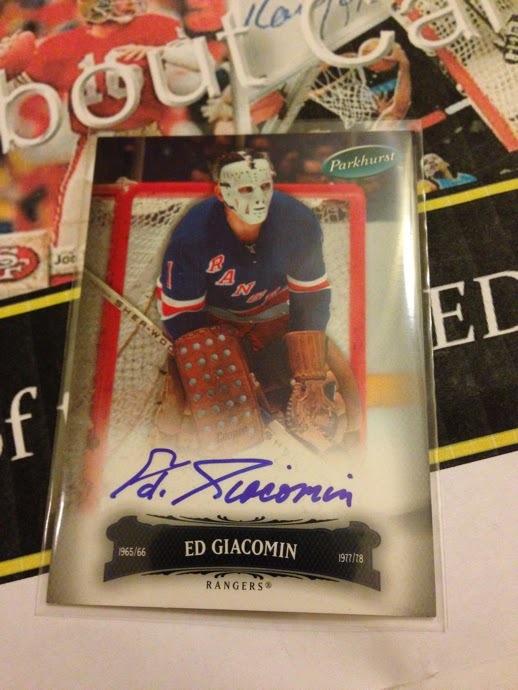 First card I eliminated was Giacomn’s 2007-08 O-Pee-Chee Autographed Buyback. Buybacks are an area I tread very lightly. Pulled from a pack, no problem. As a secondary market item, I much prefer having the a card that was intended for autographs from the beginning. I also eliminated 2012-13 Score Franchise Original Six Autograph. It is serial number #/10 and I still have not seen one. The last certified on-card autograph I took out of contention was his 2011-12 Panini Private Signings EG1. It’s Giacomin as a Red Wing. Not interested. Beside, there was another option when it came to Panini Private Signings. At only five unique cards that could have easily brought ITG back into the picture but the available number of cards that were signed for those selections was sufficient enough. I said no to the 2011-12 Panini Private Signings EG1 but could have easily said yes to the alternate version, 2011-12 Panini Private Signings EG2. It is a cool photo of Giacomin and a strong candidate but not the card I selected. Just like Gilbert, Giacomin was part of Fleer’s 2001-02 hockey version of Greats of the Game. Another cool photo from a solid release. There was also 2010-11 Dominion Signatures, a release I really like, but he only signed three color parallels for a total of 61 cards. 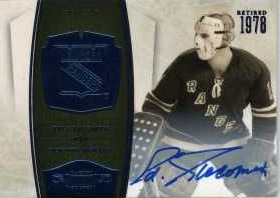 Currently there is a blue version #/10 floating around and available but the use of a black and white photo made me look at the other two certified on-card autographs left, both of them from Upper Deck’s Parkhurst line. The 2003 - 04 Parkhurst Original Six New York Autograph #/6 is limited to 90 signed copies but I much preferred the look of the other Parkhurst option. I went with the 2006 - 07 Parkhurst Autograph. I tend to like retro feel for players of a different era and this card delivers that, along with the other attributes I look for in an autograph card. A nice sized photo and a clear area for a bold signature. The back of the card is in line with earlier autograph cards. It’s plain and simple but it’s certified and that’s good enough for me. This was one of the less expensive options available and I got it for a bit less than average. Currently you can find most of the cards I mentioned above, some if you look hard enough, but because a few of these choices are small runs, there is a wide range of street and book values. Next time I’ll cover another Ranger goalie, Mike Richter.